Winnsen Water Proof Weather Proof Outdoor Intelligent Parcel Station with Shelter is designed for outdoor use, it allows customers pick up their parcels 24 hours at their leisure, it offers customers an easy and secure delivery option. Courier staff drops parcels at the lockers, a SMS message will be sent to the customer cell phone, customer could go to the lockers to pick up their parcel at any time they want. So easy! Winnsen electronic lockers and consoles integrated with Winnsen’s software provide a complete solution for parcel delivery. How to drop off parcel? 1. The courier log in. 2. Scan barcode on parcel. 3. Input receiver's cell phone number. 5. Drop parcel, close door. A SMS is sending to receiver. How to pick up parcel? 1. Receiver gets the SMS. 2. Go to the locker, inputs cell phone number. 3. Input password in SMS. 4. Take parcel, close door. Winnsen Intelligent Advanced Universal Package Parcel Delivery Locker with Different Size Available allows customers pick up their parcels 24 hours at their leisure, it offers customers an easy and secure delivery option. Courier staff drops parcels at the lockers, a SMS message will be sent to the customer cell phone, customer could go to the lockers to pick up their parcel at any time they want. So easy! 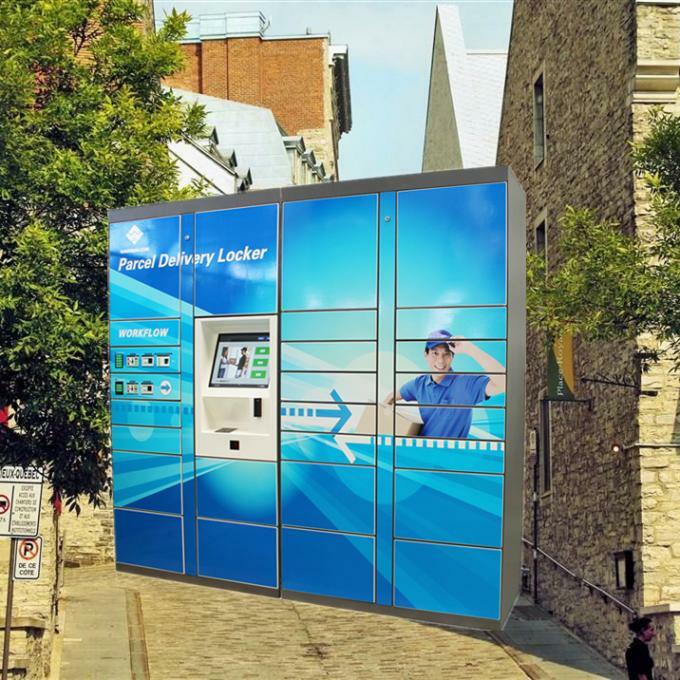 Winnsen electronic lockers and consoles integrated with Winnsen’s software provide a complete solution for parcel delivery. Why choose Winnsen Intelligent Parcel Delivery Locker Sending SMS to Mobile Cell Phone? 1) We can custom different language on user interface for you, it is also with option to display multi languages at the same time. Users could choose their native languages before purchase. 2) Nowadays interactive touch screen makes the world totally different. Winnsen vending Kiosk machine is with 15 inch touch screen to display operation instructions and goods information in both texts and pictures.